The builder is designing a new elevation for this plan. Inquire today. 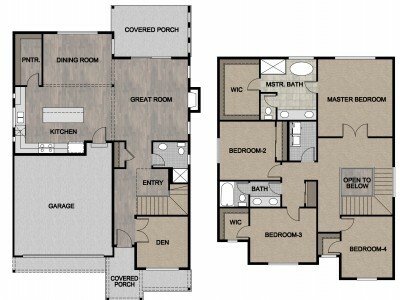 The Cedar Is the perfect floor plan that combines all the best details for functional living. Greeted in the foyer with soaring nine foot ceilings, the main floor features a roomy den, powder room complete with shower, and an open and airy great room. The focal point of this grand living space is the gourmet kitchen with enormous quartz or granite topped center island and stainless steel appliances. On the second floor you will find a graciously sized master suite with a five-piece bath including a free standing soaking tub, wardrobe mirror and enormous walk-in closet. Three additional bedrooms, a double vanity full bath, and generous utility room finish off the upstairs. Enjoy the sunset while sipping iced tea from your covered patio for years to come. You may also add an optional third bay in the garage to complete your storage needs.